I thought this article dated October 21, 2008, in the San Francisco Examiner that comments on the sociocultural contradictions that exist in the Tampa Bay area--conservative, but still progressive--aptly captures my thoughts on this part of the country. The excerpt below, includes among other things, covers the GLBT community, and reminds us that life in Tampa Bay is highly diverse, giving rise to volatile sociopolitical expressions. According to the Chamber of Commerce, in 2005 alone, 46,226 people from at least 483 counties across the country joined us and settled around Tampa Bay, in mobile home parks and turn-of-the-century bungalows and McMansions behind big gates. Nearby my home are two developments of $1 or 2 Million homes, all now dormant and empty. Downtown multi-million dollar condos are started then abandoned and sit vacant. There is confidence that this will change when the economy improves but for now, there is and it is Depression. 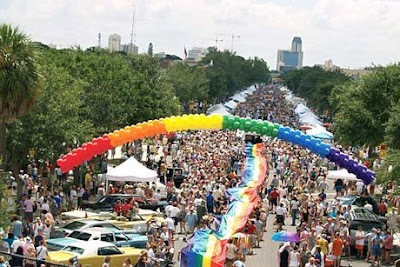 We have, according to a 2006 UCLA study, the fifth-highest percentage of gay, lesbian and bisexual residents of the top 50 metropolitan areas in the country, behind San Francisco, Seattle, Boston and Portland, Ore. We also have a county commission that voted to ban county sponsorship of Gay Pride events.